Ol-Vir is a 30th Century Daxamite, Servant of Darkseid, ally of Validus, and member of the Legion of Super-Villains. He appeared in 1982 during the Great Darkness Saga, perhaps the most famous story arc for DC Comics’ Legion of Super-Heroes. Ol-Vir is a child and he’s insane. He’s simultaneously powerful, tragic, and creepy. Other Aliases: The Mad Daxamite. Group Affiliation: Legion of Super-Villains; servant of Darkseid and ally of Validus. Base Of Operations: Mobile within the United Planets. Other distinguishing features: Ol-Vir is a child, no more than twelve when first encountered, perhaps thirteen when he joins the LSV. Ol-Vir has the full range of Daxamite powers, which are basically identical to Kryptonian powers. This means that under a yellow sun he possesses vast super-strength, invulnerability, flight, superspeed, super breath, heat vision, supervision, superhearing, etc.. He’s a kid, so his strength is slightly less than that of an adult like Mon-El. His inexperience also makes him less sophisticated at using his powers. For example, he has super breath, but hasn’t shown advanced applications like freezing breath or the ability to create a “super-suction” effect drawing objects to him. And, at least when he was first empowered, his inexperience with X-Ray Vision sometimes had him looking, not just through objects, but also through the people he was searching for without realizing it. Ol-Vir also has normal Daxamite vulnerabilities, notably an intense and fatal allergy to lead. High gravity, like that of his home planet Daxam, will weaken some powers (flight, speed, strength), and a red sun like that of his homeworld would strip them away entirely. He’s also vulnerable to magic. Ol-Vir, the Mad Daxamite, is one of the tragedies of the 30th Century. A child with the powers of Superman and a penchant for human sacrifice, a member of the Legion of Super-Villains, ally of Validus, and tool of Darkseid, he is incredibly powerful and very dangerous. Ol-Vir was a 12 year old child when the Great Darkness fell on Daxam. Darkseid, Dark Lord of Apokolips, possessed the minds of Daxam’s 3 billion inhabitants, teleported the planet to a yellow sun system, and turned the people into a mindless army. After having them devastate their own world (shaping it into a monument to him), Darkseid sent them out to subdue the galaxy in his name. Ol-Vir went, alone, to the United Planet’s prison world of Takron-Galtos, where he caused tremendous destruction. 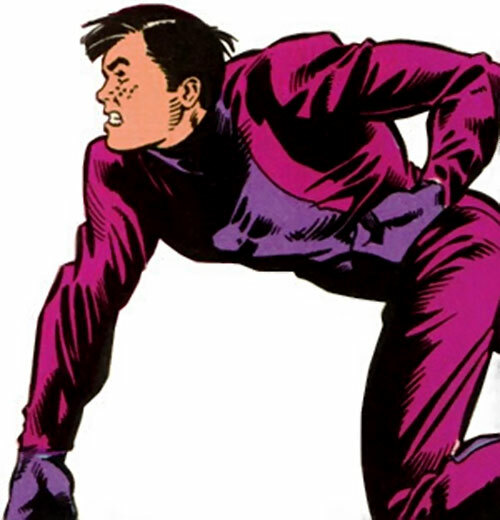 He was defeated when Chameleon Boy of the Legion of Super-Heroes tricked him into entering the cell of Validus. Ol-Vir found himself trapped between indestructible inertron walls and a monster whose power exceeded his own. 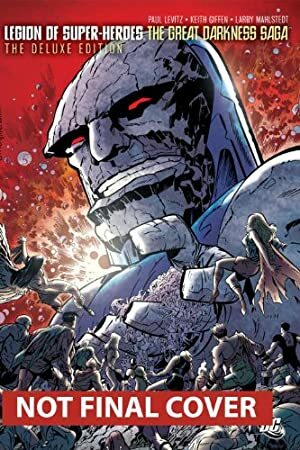 Once Darkseid was defeated, his control over the Daxamites ended. They tried to resume their normal lives. Daxam was returned to its native star, and the people began to rebuild with help from the Legion, the Science Police, and the UP. The planet was devastated, of course, but restoration went quickly and well, for the most part. The UP was nervous about the power of Daxam and the planet was placed under a tight quarrantine. But there was a bigger problem. Ol-Vir continued to worship Darkseid of his own free will. Whether Ol-Vir had been mentally unstable to begin with or the horrors of Darkseid drove him insane, the child now gave himself wholeheartedly to worship of the Dark Lord. Presumably he snuck off Daxam, somehow eluding the quarrantine and making his way to a yellow sun system where his powers were restored. However he managed it, he surfaced back on Takron-Galtos and took up a distorted and psychotic version of the task he’d originally been given by his Master. Ol-Vir began breaking prisoners loose, preaching the worship of Darkseid to them, and offering up prison guards as human sacrifices. After saying a prayer and congratulating the “chosen one”, he would burn them alive with his heat vision. When the alarm was raised and the Legion of Super-Heroes intervened, he accepted an offer of rescue from the Legion of Super-Villains. Ol-Vir and several other released prisoners were teleported away from the LSH by Zymyr of the LSV. The LSV found Ol-Vir’s raw power very useful, particularly as he could counter Legionnaires like Mon-El and Ultra Boy. They were able to contain the worst of his madness via the telepathic powers of Esper Lass. 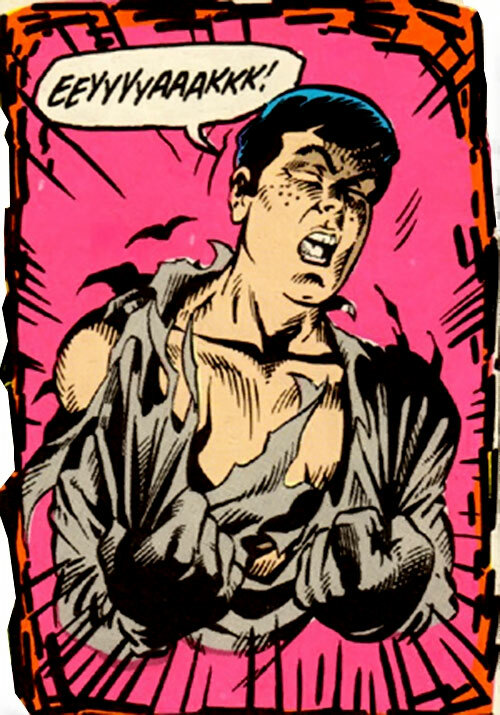 But during the climactic battle between the Legions, in an other-dimensional Limbo, Element Lad defeated Ol-Vir by transmuting his shirt to lead. Screaming in pain, ripping the shirt away as he flew into space, Ol-Vir disappeared into Limbo. He resurfaced some months later on Rimbor, perhaps the most lawless world in the United Planets. How he got there from Limbo has never been clear. It seems likely that Darkseid intervened, both returning him to this dimension and ’healing‘ him from his exposure to lead. Certainly Ol-Vir claimed that Darkseid had taken the pain away. Ol-Vir now looked far less human. He resembled one of Darkseid’s “Servants of Darkness”. However, Ol-Vir maintained that he was not a clone or “mockery” such as had served “the Master” during the Great Darkness. On Rimbor, Ol-Vir once again began promoting Darkseid worship among the criminal element. He built a shrine, distributed idols, and again practiced human sacrifice. But Darkseid’s purpose in sending Ol-Vir to Rimbor seems to have been to team him up with Validus. 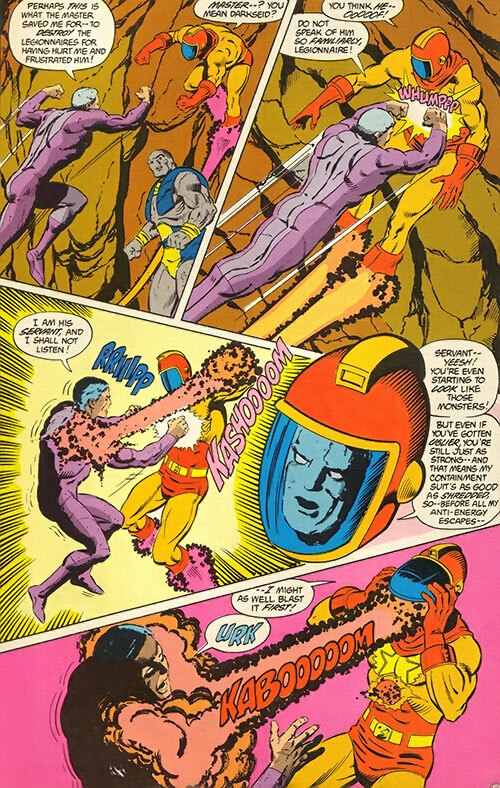 The living embodiment of Darkseid’s curse against the Legion of Super-Heroes, Validus was believed to have died in the destruction of Takron-Galtos during the Crisis on Infinite Earths. Darkseid had actually teleported him to Rimbor where Ol-Vir found him. When a team of Legionnaires investigated the strange occurences on Rimbor and found Ol-Vir and Validus, Darkseid once again teleported the duo away, this time to Earth. 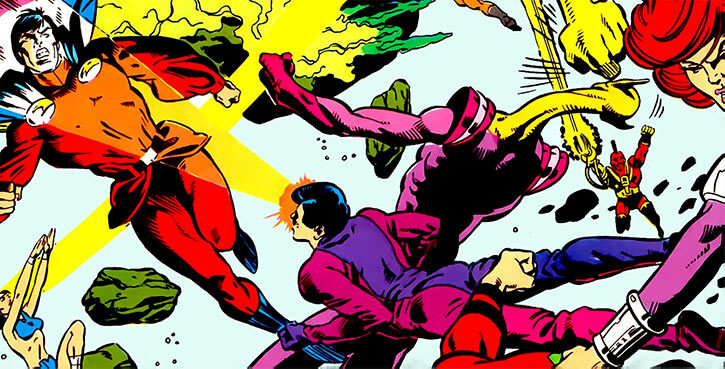 While Ol-Vir cheered him on, Validus attacked the nearly deserted Legion Headquarters, taking the symbols for Lightning Lad and Saturn Girl from the Mission Monitor Board. Then Darkseid teleported them away again, this time to Saturn Girl and Lightning Lad’s vicinity on the planet Winath. While Ol-Vir looked on, laughing and shouting praises to Darkseid, Validus captured Graym Ranzz, infant son of Saturn Girl and Lightning Lad. Ol-Vir was in ecstasy at the prospect of battle between Lightning Lad and Validus, delighted by the fulfillment of Darkseid’s curse. 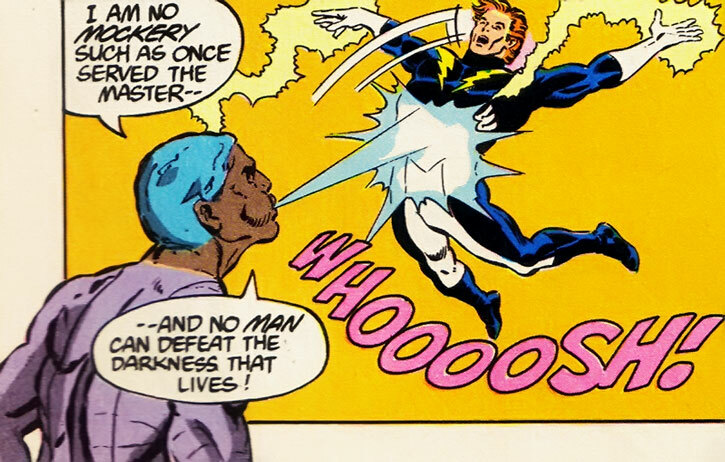 Lightning Lad threatened to kill Validus to save his son Graym. But during the battle Saturn Girl touched Validus’ mind and realized the truth. 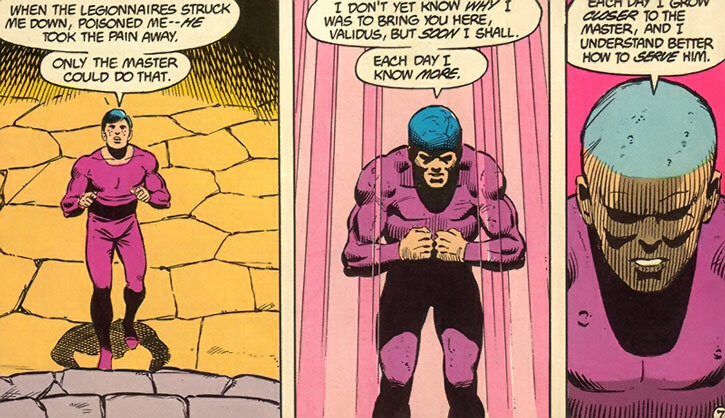 Validus was also their son, Graym’s twin, stolen at birth and horribly altered by Darkseid. When Saturn Girl fell to her knees, demanding and then begging for Darkseid to return her son, the inscrutable Lord of Darkness chose to grant her prayer, restoring Validus to human form. Ol-Vir literally threw a tantrum, throwing himself down on the ground, pounding it with his fists, questioning why Darkseid was showing mercy. In response, Darkseid reduced him to dust, stating only that it was not for servants to question their masters nor for mortals to question the games of the gods. Darkseid’s final words, as Ol-Vir crumbled to dust, were that Ol-Vir had come from the darkness and was now returning to it. 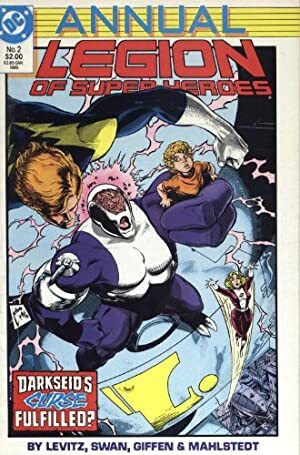 As noted above, during his association with Validus Ol-Vir was greatly altered in appearance, taking on the non-human look of Darkseid’s Servants of Darkness, who were all clones. Though Ol-Vir stated that he was not a “mockery” like the Servants, it is possible that this may still have been a clone of Ol-Vir, one that didn’t realize it was not the original. Even if it was the true Ol-Vir, though, it is certainly within Darkseid’s capabilities to create a clone of him, or even to reconstitute the original, as he did with Desaad and others numerous times in the 20th century. Ol-Vir is a freckly-faced kid with blue eyes and black hair. He generally wears green or purple jumpsuits. In his final appearances he looked less and less human, taking on the craggy, rocky appearance of Darkseid and his Servants of Darkness. Ol-Vir is unquestionably insane. He is absolutely devoted to his personal vision of Darkseid, spreading pain, evil, and death. He’s still childish in many ways. He enjoys “playing” with some opponents rather than killing them quickly, and throws tantrums when he is thwarted. 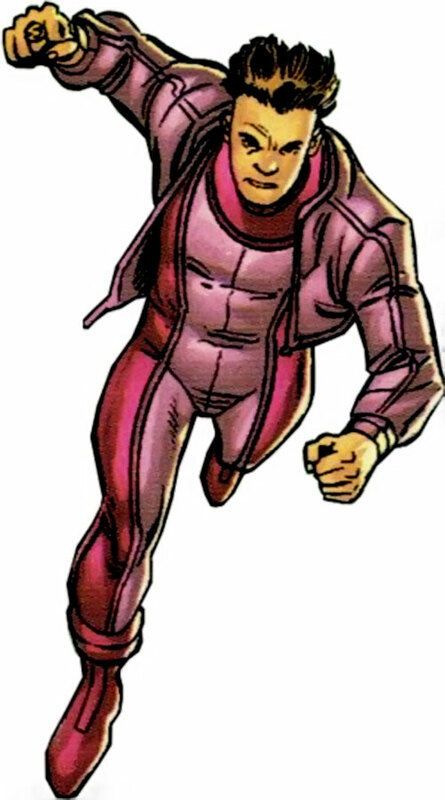 Ol-Vir later appeared as a member of the LSV during the Final Crisis: Legion of Three Worlds crossover. For that matter, so did Validus, and other dead villains like Tharok and the original Emerald Empress. No explanation was given for their presence and no one commented on it as an oddity. This gives the strong impression that that story took place in a timeline which diverged at some point from the original, probably around the time of the first Crisis. Given Ol-Vir’s association with Darkseid, who can move through time, space, and dimensions, Ol-Vir could show up literally anywhere and anywhen. X-Ray Vision cannot see through lead (-1 FC). Superspeed requires a Dice Action to activate, kicking in at the very beginning of the next Phase (early enough to affect Initiative). He thus has two Initiative scores as seen above (-1 FC). Darkseid (Low), Legion of Super-Villains (Low), Validus (Low). 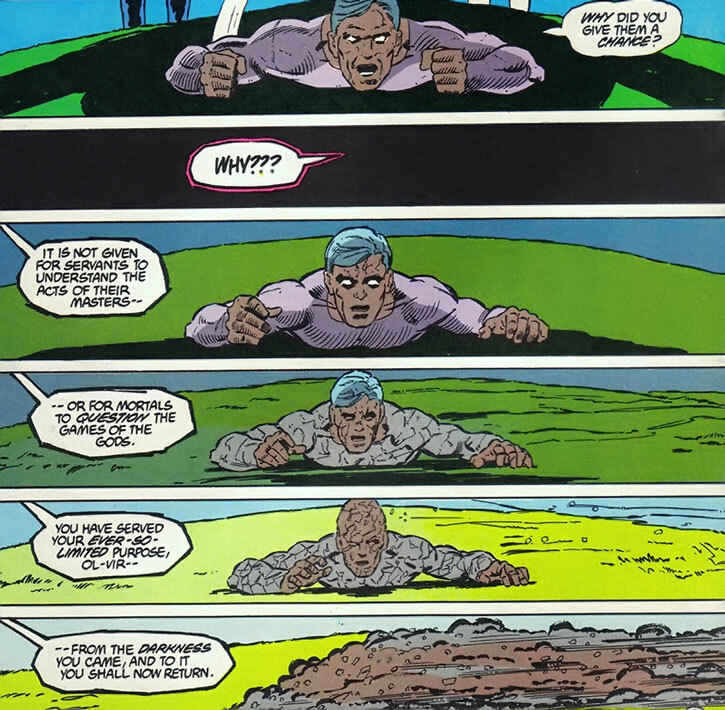 Age (Young – age 12 or 13); Catastrophic Irrational Attraction to worship of Darkseid (includes obeying Darkseid, preaching him to others, and performing human sacrifices), Distinctive Appearance (resembles a Servant of Darkness, last appearance only), Pre-Crisis Daxamite Vulnerabilities Package (see below). Fatal Vulnerability (Lead – range of 0 APs – however, Killing Damage from lead exposure does not revert to Bashing Damage even when the lead is taken away, as explained below). Gradual Loss Vulnerability (all Attributes and Powers, being within 1 AP of lead – however the Gradual Loss is 3 APs per Phase). Loss Vulnerability (all Attributes and Powers, under red sun radiation). Attack Vulnerability (-4 CS OV/RV vs. attacks laced with ’red solar rays’). This represents the weakening of Ol-Vir’s powers in the presence of ’red solar rays’, but obviously applies only when Ol-Vir is not already under a red sun – that situation being covered by his Loss Vulnerability. Power Loss (being in a high gravity environment reduces STR, Flight, Super Breath, and Superspeed by whatever degree the GM decides). SIA to having gravity-based attacks lower his power. If this SIA kicks into action, gravity-based attacks have the additional effect of lowering Ol-Vir’s Attributes and Powers by any RAPs they get, for RAPs of time. RAPs are cumulative as long as any RAP is active. If this SIA doesn’t kick into action, then he isn’t particularly bothered by gravity attacks. Attack Vulnerability (Magical attacks, – 4CS OV/RV). Misc. (attempts to physically damage magical materials and energies receive a -4 CS to their AV/EV). Loss Vulnerability (STR and all Powers are useless against magical energies). Misc. (all EVs used against magic are reduced to 04). Pre-Crisis Daxamites react to lead in much the same way a Kryptonian reacts to kryptonite, with one important difference. Supposedly they don’t recover from lead poisoning, even once the lead has been taken away. That’s the whole reason Mon-El had to stay in the Phantom Zone for a thousand years waiting for a cure. But in other stories, lead doesn’t seem quite so lethal. With Brainiac 5’s guidance, Element Lad adds lead to the atmosphere of a whole planet to take down part of Darkseid’s Daxamite army, and they’re incapacitated but they don’t die. In a later encounter, Element Lad turns Ol-Vir’s shirt to lead, sending him fleeing into space, ripping the shirt off and screaming in pain. Ol-Vir credits Darkseid for healing him, and it’s after that time that Ol-Vir starts assuming the appearance of Darkseid’s cloned Servants of Darkness. It’s entirely possible that he died and was cloned without knowing it, though again it seems unlikely that Element Lad would have resorted to taking a step that he knew would kill Ol-Vir. In any case, the stories are inconsistent. For gaming purposes, I’ve used a compromise measure that seems to fit all the incidents. Killing Damage caused by exposure to a Fatal Vulnerability normally converts to Bashing Damage once the substance is taken away. In the case of Daxamites exposed to lead, it doesn’t. Killing Damage caused by lead exposure remains Killing Damage, and is thus much slower to heal. If the Daxamite’s Body is reduced below 0 before the lead is taken away, then even removing the lead won’t stop him or her from sliding toward death. This is a Pre-Crisis character on basically a post-Crisis scale, but I’ve tweaked that scale just a bit. Like many writeups, this takes the “Superman’s DEX is 10, although he sometimes uses his Superspeed to make it higher” approach. (Though personally I think it’s more likely he has a DEX of 08 or 09.) If you give Superman a DEX of 15, increase Ol-Vir’s DEX to 11. 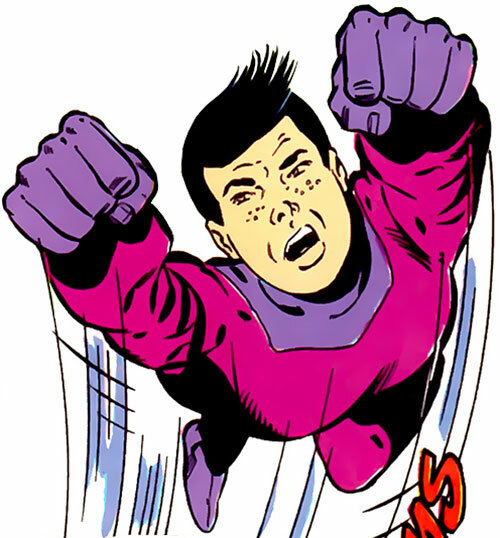 Ol-Vir, like other Kryptonian and Daxamite characters in LSH stories, is more than capable of flying interstellar distances at trans-light speeds. 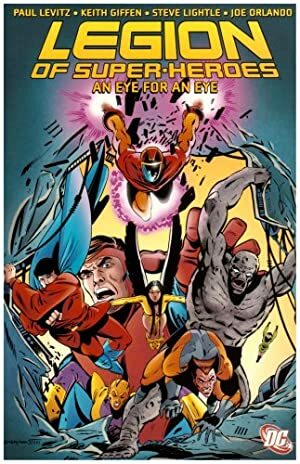 The high flight speeds of characters like Mon-El, Ultra Boy, Superboy, Wildfire, and Dawnstar are well established in many Legion stories; those characters are often sent to trouble spots ahead of other Legionnaires, who must follow in the slower Legion Cruisers. Ol-Vir’s Flight speed is therefore still at pre-Crisis (1st edition) levels. By that scale, Superman has Flight: 45. Because of his youth and inexperience, I’ve put Ol-Vir a bit behind him at Flight: 44, on par with Mon-El. Krypton-class characters in pre-Crisis Legion stories definitely have superspeed, but unlike the warp-speed Flight it’s not a big enough factor in their performance to require 1st edition levels of Superspeed from them. In fact, Superboy was definitely outclassed by the Tornado Twins in one Silver Age story. So there’s no problem with keeping their Superspeed in line with the post-Crisis scale. I didn’t bother giving Ol-Vir some of the more obscure and rarely used Powers of Pre-Crisis Kryptonians, like Recall and Super-Ventriloquism. Logically he should have them but they’re not demonstrated and have little utility most of the time. If you wish, you could add them back in as Marginal powers, where the HP expenditure to use them reflects that he’s a novice with little experience using his powers. Likewise, because Ol-Vir hasn’t learned the sophisticated control that Supergirl and Superman has, he has the basic Power of Super-Breath, but not the more controlled Attaction/Repulsion variant. In Universe 3001, Kryptonians and Daxamites are slightly more invulnerable than 2nd or 3rd edition stats. Superman’s BODY is around 20, and Ol-Vir would have a BODY of 18. Source of Character: Pre-Crisis DCU (Legion of Super-Heroes). Writeup updated on the 29th of November, 2013.